In our ongoing quest to lead a more eco-friendly life, today we are sharing a super simple cloth napkin tutorial. I am always astounded to learn of families who are using paper napkins and paper plates at home. Not only is this uneconomical, it is a waste of resources. 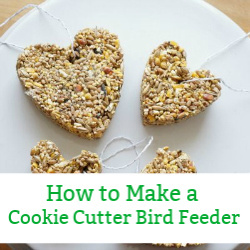 Even if you consider recycling and composting the paper napkins and paper plate, we only need to look at what is involved in manufacturing these products. Consider the raw materials used, the dyes and the manufacturing of the paper napkins. While cloth napkins are made from fabric, it is possible to purchase inexpensive fabric that has been made using eco-friendly dyes and growing practices. As for the life of a cloth napkin versus a paper napkin. I made a batch of napkins 2 years ago, that we still use to this day. 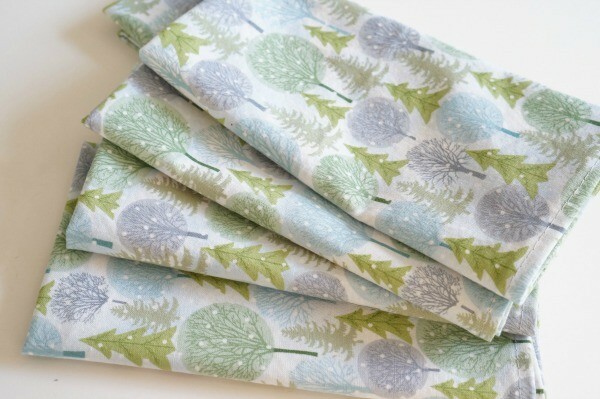 For a little investment in money and time you can have an eco-friendly napkins for your entire family. Start by cutting your fabric into 15 inch x 16 inch rectangles. You can cut a template out of cardboard and have the kids do the tracing and cutting. Once all your rectangles are cut…we were able to get 6 napkins out of 2 metres of fabric…it is time to iron and pin the hem. Turn the hem of one side of fabric…you will want to fold the edge 1/4″ and then another 1/4 ” – thus tucking in the raw edge. 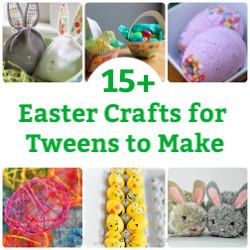 Press this edge with a hot iron…the kids can’t help with this step…but they can watch. Once the edge is ironed, pin. Next move on to the opposite side. Repeat. When you have the two side ironed and pinned, it is time to work on the third side. 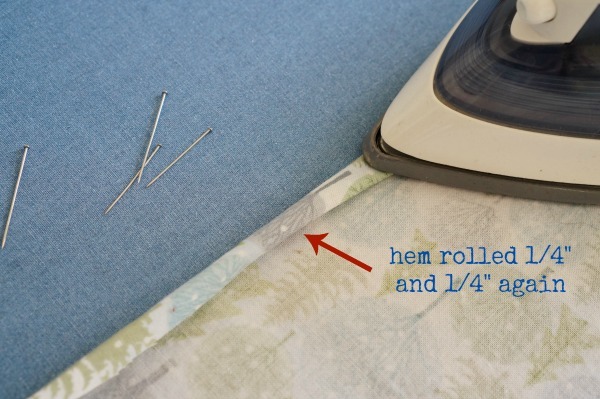 Turn the hem, as with the other sides, making sure to fold the fabric tightly at the corners. Iron and pin. Repeat on the final side. Now it’s time to sew! 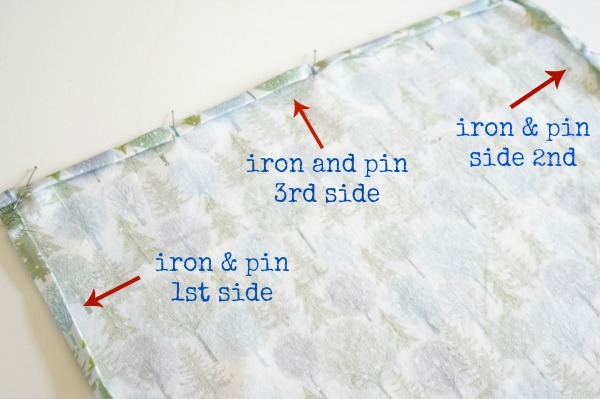 Using a straight stitch, sew along the hem until you have made your way around the napkin. The kids can help with this step. Trim the thread…done. I was able to make all 6 napkins, from beginning to end in one afternoon…with interruptions from said children. 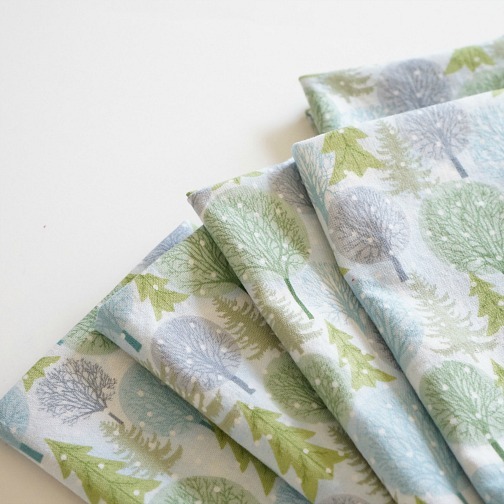 My youngest daughter chose our sweet winter tree fabric, which cost us about $8. 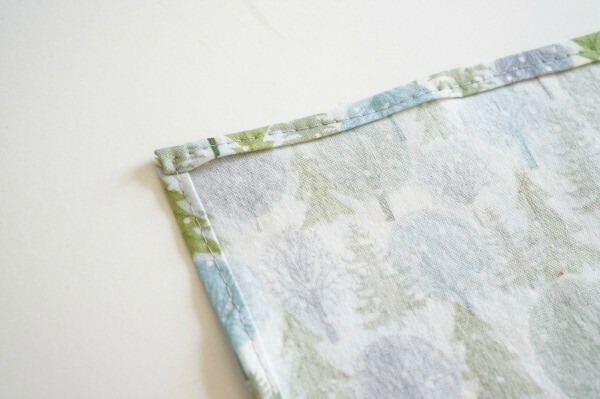 Making cloth napkins is kind of addicting. 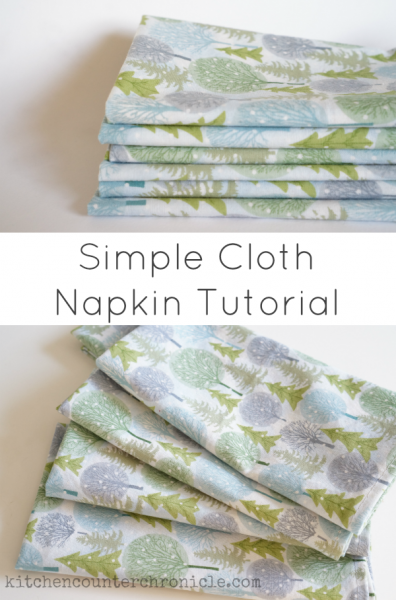 You will be surprised how easy it is and how you want to turn all of your fabric scraps into napkins. Please share what eco-friendly things you are doing around your house on Instagram, Facebook and Twitter. Use the hashtag #familyecochallenge and we can all follow along. This month’s theme is “home”. Looking for more green living ideas? Check out our Family Eco-Challenge archive and follow us on Pinterest. 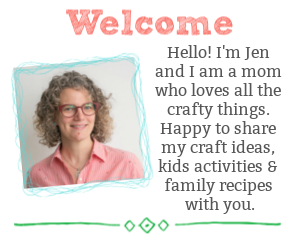 Be sure to subscribe to Kitchen Counter Chronicles to have our eco-friendly activities, delicious recipes & fun crafts delivered directly to your inbox.